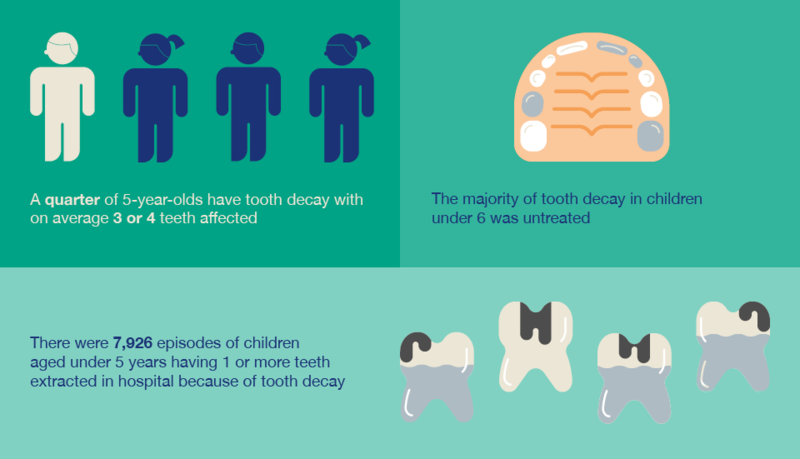 Welcome to the latest edition of PHE’s Health Matters, a resource for local authorities and health professionals, which this month brings together the important facts and figures on child dental health and evidence of effective interventions to prevent tooth decay in children under five. Tooth decay is largely preventable yet it remains a serious problem. PHE data shows that in 2015, a quarter of 5-year-olds experienced tooth decay in England, and the vast majority went untreated. In 2015-2016 tooth decay was the most common reason for hospital admission for children aged 5 to 9 years-old and the sixth most common procedure in hospital for children aged 4 years and under. Children who have toothache or who need treatment may have pain, infections and difficulties with eating, sleeping and socialising. They may have to be absent from school and parents may also have to take time off work to take their children to a dentist or to hospital. Oral health is therefore an important aspect of a child’s overall health status and to children’s school readiness, and is seen as a marker of wider health and social care issues including poor nutrition and obesity. Tooth decay and obesity may be more likely to occur together given that excessive intake of sugar and social deprivation are risk factors for both conditions. 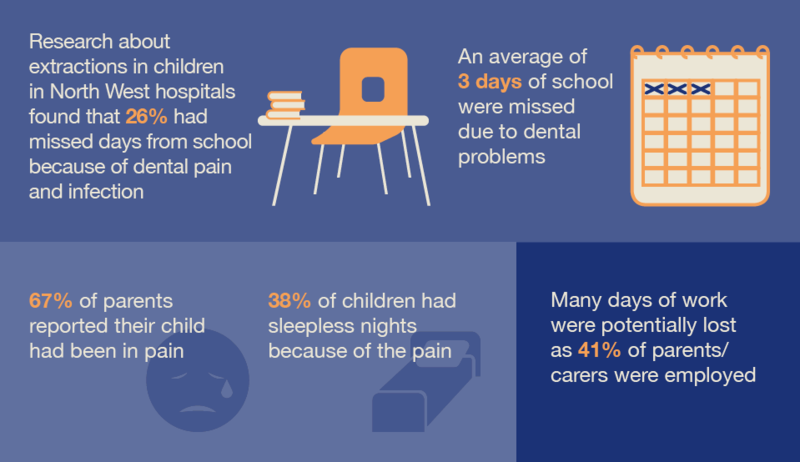 Figures from 2015 show wide variation in the prevalence of tooth decay; children living in areas in the north and in more deprived local authority areas tend to have poorer dental health. Despite being largely preventable, dental disease places significant costs on the NHS. 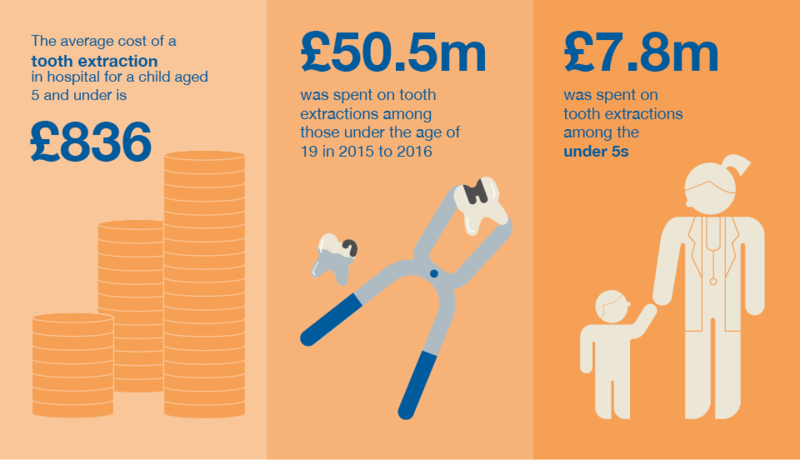 In 2015 the average cost of an episode of tooth extraction in hospital for a child was £836, and in 2015-16 tooth extractions in children aged 0-19 years cost approximately £50.5 million. The majority of these were for tooth decay. For children aged 4 years and under the cost of tooth extractions was approximately £7.8 million. Every child who has teeth is at risk of tooth decay, but the risk increases for children who are more likely to be eating a poor diet that is high in sugar or less likely to be brushing their teeth twice daily with fluoride toothpaste. Often these are children living in more deprived areas. There are a number of cost effective interventions to prevent tooth decay that can save money in the long term and reduce the number of children needing time off school for treatment. This edition outlines the interventions that are supported by evidence and can demonstrate a clear impact. For example, targeted community fluoride varnish programmes can result in an extra 3,049 school days gained per 5,000 children and PHE estimates that after 5 years, the return on investment for this intervention is £2.29 for every £1 spent and £2.74 after 10 years for every £1 spent. Other interventions include water fluoridation schemes and the provision of toothbrushes and paste by post and health visitors. PHE’s sugar reduction programme will also support children and families to consume less sugar and reduce their risk of tooth decay. We launched a Children’s Oral Health Improvement Programme Board in 2016 with a wide range of partners and stakeholders to improve the oral health of all children and reduce the oral health gap for disadvantaged children. Improving child dental health requires a whole-systems approach, with action across the sector, from national and local health policy, to healthcare, families and the food and drink industry. Whilst local authorities have a lead role in improving the oral health of their local population, everyone has a part to play. This edition of Health Matters outlines how all partners across the health and care system can help prevent tooth decay in children under 5 as part of ensuring every child has the best start in life. From commissioning oral health improvement programmes to identifying and advising families that need additional support, commissioners, local authorities, health professionals and voluntary organisations all have a role – and this edition sets out calls to action across a wide range of partners. PHE has produced tools and guidance to support better oral health for children and babies at local and national level, including a review of the cost-effectiveness of interventions to improve the oral health of children aged 0-5 years and an ROI tool. These resources are highlighted throughout the edition, and a set of infographics and slides are also available to support local commissioning and service delivery. Visit the Health Matters area of GOV.UK or sign up to receive the latest updates through our e-bulletin. If you found this blog helpful, please view other Health Matters blogs.